Rattanak Kiri is the province that is rich of nature. The natural landscape with many impressive points is considered the treasure not for this province but for Cambodia. Rattanak Kiri is the mountain place which has the Annamite Range in the north and the plateau in the area that Tonle Sap and Tonle Srepok pass through. Rattanak Kiri is located in the northeast of the country. It is bordered with Stung Treng province in the west, with Mondul Kiri Province to the south, with Laos to the north and with Vietnam to the east. Districts: The main city in Rattanak Kiri is Banlung City that attracts many tourists who to come to visit each year. There are some other districts in the province such as Andoung Meas, Bar Kaev, Koun Mom, Lumphat, Ou Chum, Ou Ya Dav, Ta Veaeng and Veun Sai Districts. Climate: Rattanak Kiri province has the same climate as other provinces in the country. There is the rain time in this area from June to October, the dry time from November to May in which the cool time is in the time of November to February. The average temperature is from 24 to 27 C degree. Yeak Laom Lake: the famous lake in Rattanak Kiri Province and in Cambodia with a thousand years old. The lake is beautiful place with the calmness and quiet feature. Of course the rich nature around to make you to have the unforgettable trip here. 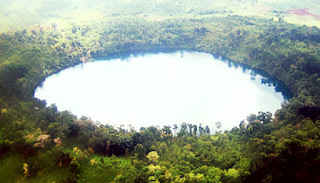 Yeak Laom Lake is located far from Banlung City about 5 km to the north. Ethnic Minority Museum: the simple museum but it has the rich collection related to the life and culture of minority in Rattanak Kiri. The museum is located nearly Yeak Laom Lake. It is always the destination in the tour to Yeak Laom Lake of tourists who come to Banlung City. Cha Ung Waterfall: one of the wonderful waterfalls in Rattanak Kiri Province. The waterfall is more than 20 m high with the pure and sweet water that has its source from the Phnom Svay Mountain. Cha Ung Waterfall is in Ou Chum District. It is far from Banlung City’s center nearly 10 km to the west. Kachanh Waterfall: the waterfall is the ideal place for picnic time in Rattanak Kiri Province. Kachanh Waterfall is not high much as Cha Ung Waterfall but it has the length and the wide space with the very pure atmosphere. Beside Kachanh Waterfall is near the Banlung City more than Cha Ung Waterfall, so the distance is the good point to attract tourists who to come to explore. Kachanh Waterfall belongs to the area of Kachanh Commune. It is far from Banlung City’s center just more than 5 km. Katieng Waterfall: Rattanak Kiri province is the mountain province, so it is not strange if there are many waterfalls in this area. There are many famous waterfalls in the province. In the list of waterfalls here, it must be Katieng Waterfall existed in. Katieng Waterfall is located far from Kachanh Waterfall just some kilometers. It is 10 m high and it is considered one of the gentlest waterfalls in the province. Lumphat Wildlife Sanctuary: the fascinated place for tourists who love the nature strongly. Lumphat Wildlife Sanctuary has it’s the rich flora and fauna system. This is considered one of the ideal places for camping. Lumphat Wildlife Sanctuary is in the Phnom Prik National Park. The place is a part of Rattanak Kiri Sanctuary. Ou’Sinlair Waterfall: the amazing waterfall with 7 levels to make the perfect picture in the huge nature with mountain and forest. The waterfall belongs to the area of Lum Phat District. It is located far from Banlung City’s center about 30 km to the southwest. Independence Day: the event is happened in 09 November each year in Rattanak Kiri province and all provinces in Cambodia. Victory Day: the event is happened in 08 January each year in Rattanak Kiri and all provinces in Cambodia. .
Khmer New Year: it is happened from 13 April to 16 April in Rattanak Kiri and all provinces in Cambodia. One of the points for you to explore the cuisine in Rattanak Kiri Province is street food in Banlung City. The street food in Banlung City is cheap and so good with different dishes that have the typical feature of local cuisine. You can taste the Cambodian food in local style of cooking with the famous dishes such as fish amok, sticky rice and Khmer food. There are different flavor here that you can taste from Thai food to Chinese food, Vietnamese food and of course European dishes.